Chef Bhadouria is the winner of Master Chef Season 1. She hosted her first cookery show � "Chef Pankaj ka Zayka" on Star Plus during Sep-Oct 2011. She was invited to address the South Asian Community in Britain by Cambridge University in July 2011. She demonstrated some Indian foods for health conscious people and managed to break the general British myth that Indian food is all about spicy curries and �Chicken Tikka Masala�. Her first cookbook, The MasterChef Cook Book, was released on November 2011. The second cookbook turned out to be the one for little girls! It comes as a part of a �Barbie I Can be Chef� kit. She does a monthly column for a Hindi Magazine � Grehlaksmi � for women in India. 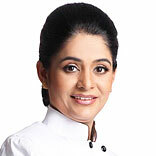 In August 2012, she launched The Pankaj Bhadouria Culinary Academy. Her signature Caf� -Tramp Tree Caf�, is situated in Hazratganj, Lucknow. Currently she is busy working on her upcoming restaurant overseas. In the month of October 2012, Pankaj shot with UK�s Top Chef Rick Stein who was touring India for his BBC series, The Search for the Perfect Curry. It was Chef Bhadouria who introduced Chef Stein to the delicate flavours of the Awadhi Cuisine. This was telecast as part of the 6th Episode of Rick Stein�s India on 22nd July 2013 on BBC 2. She endorses Eastern Masalas, India�s biggest spice manufacturers and exporters. She is the Brand Ambassador and face for Hindustan Unilever Limited's "Hunar Aapka, Pahchan Hamari" campaign in small towns of UP. She has been chosen by Amway India as their Brand Ambassador for their popular product Nutrilite. Ms. Bhadouria has had the honour of serving the King of Bhutan and the Chief of Armed Forces during their visit to Lucknow in 2011 where her signature dishes were highly appreciated. Ms. Bhadouria has her own mobile applications, which is available on Black Berry, I Phones, Google play, worldwide. How To Start Your Restaurant helps you understand how to start your own restaurant business. It answers all the important questions you need to ask before starting and gives you a realistic picture of the Restaurant industry in India.